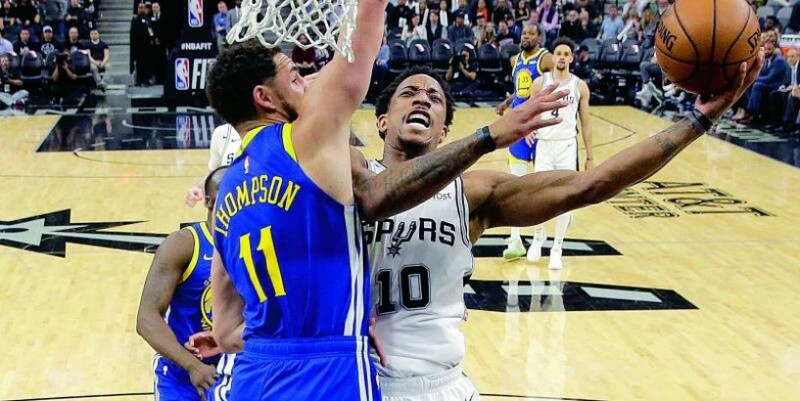 San Antonio Spurs guard DeMar DeRozan (10) drives to the basket against Golden State Warriors guard Klay Thompson during their NBA game in San Antonio on Tuesday. Spurs won 111-105. (Photo: AP) Los Angeles: The San Antonio Spurs rolled to their season-best ninth straight win by toppling the two-time defending champion Golden State Warriors with a 111-105 victory on Tuesday. DeMar DeRozan scored 26 points and LaMarcus Aldridge finished with 23 points and 13 rebounds as the NBA’s hottest team guaranteed themselves a league record 22nd straight winning season. “We worked very hard. They are the defending NBA champs and they move and cut better than anybody in the world,” said Spurs coach Gregg Popovich. “The effort was there for 48 minutes and we learned a lot,” added Popovich. Stephen Curry led the Warriors with 25 points, and Kevin Durant returned from a two game injury absence to score 24 points for the Golden State Warriors. “We had a couple of breakdowns at crunch time. We fought hard and they just made shots down the stretch,” said Curry. The Spurs defence has been a catalyst during their winning streak. Australia’s Andrew Bogut, who signed with the Warriors on March 6 after playing this season in the Australian National Basketball League, made his season debut for the Warriors. Bogut played 10 minutes and finished with seven points and seven rebounds. Bogut played for the Warriors from 2012-16 and was a key member of Golden State’s 2014-15 championship team. The Spurs took a four point lead at the end of the third quarter then cruised from there, leading by as much as nine points in the fourth. Davis Bertans’ nailed a three-pointer with just under two minutes to play to give San Antonio a 109-102 lead. The Nuggets won 46 games last season, but missed the playoffs after losing in overtime to Minnesota on the final day of the regular season. Kyle Lowry posted 15 points before he was forced to leave the game with an ankle injury as the Toronto Raptors drubbed the New York Knicks 128-92. Eight Raptors finished in double figure scoring as they rolled over the Knicks for their fourth win in six games. In Dallas, Dirk Nowitzki swished a 20-foot jumper with 8:35 left in the first quarter, passing Wilt Chamberlain for sixth place on the NBA’s career scoring list — but it wasn’t enough for the Dallas Mavericks. Elfrid Payton had his fifth straight triple-double and Julius Randle scored 30 points to help the New Orleans Pelicans beat Mavericks 129-125. Nowitzki moved past Chamberlain (31,419 points) by making his first two shots of the game. The first was a 20-footer off an assist from Jalen Brunson. Then the 40-year-old German took a feed from Luka Doncic and backed down Kenrich Williams before turning and launching from the top of the key. “I took my time and faced him up like I’ve done a million times and tried to shoot over him,” Nowitzki said. Payton had 19 points, 11 assists and 10 rebounds. Dallas rookie Luka Doncic turned in a triple-double with 29 points, 13 boards and 10 assists.